¡¡¡EL ACABOSE!!! ¡¡¡LA CAGADA INTERNACIONAL!!! 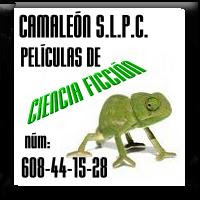 CAMALEÓN S.L.P.C. NO PODRÁ HACER PELÍCULAS HASTA MEDIADOS DE AGOSTO DE ESTE AÑO POR PROBLEMAS TÉCNICOS Y RENOVACIÓN DIGITAL. CAMALEÓN S.L.P.C. SEGUIRÁ ACTUALIZANDO LOS BLOGS Y RESPONDIENDO E INFORMANDO A TOD@S L@S SEGUIDORES/AS. DE UN AMIGO FOREVER, GERARDO G.C.